May 28 is the Armenia's First Republic Independence Day. This day also significant because of the very important footbal fighting. We are all have an opportunity to enjoy the sport meeting in the indie and free country. The Champion's league final's epic battle is awaited by all football fans. May 28. 22:45 P.M. Milan's "San Siro" stadium is going to be on the spotlight of whole world. Spanish two more titanic teams: "Real Madrid" and "Athletico Madrid" are meet face to face. The two more important questions have tortured fans: "Who will win?" and "Where to watch it? Reservin Armenia decided to help them with resolving one of the questions. We prepare for you a list of Yerevan's places broadcasting hot soccer meeting. Our partner Coffeeshop Company Yerevan affords the opportunity for the football fan guests to watch a game on 22:45 enjoying the best coffee, unique dishes and bartender's special drinks mixed by football mood. The epic end of Champion's League will broadcast in Coffeeshop Company Yerevan to branches located on Amiryan 4/5 and Old Yerevanian 2-6. You can also choose to watching final in BEERevan restaurant with crayfish and beer. There is a good surprise have keeping for you if you reserve tables previously. BEERevan's address is Abovyan 26. Another alternative for watching Champions League finale is Beer Academy. Crayfish, five kinds of beers, and other things are waiting for you at 22:45. The address is Moskovyan 8. 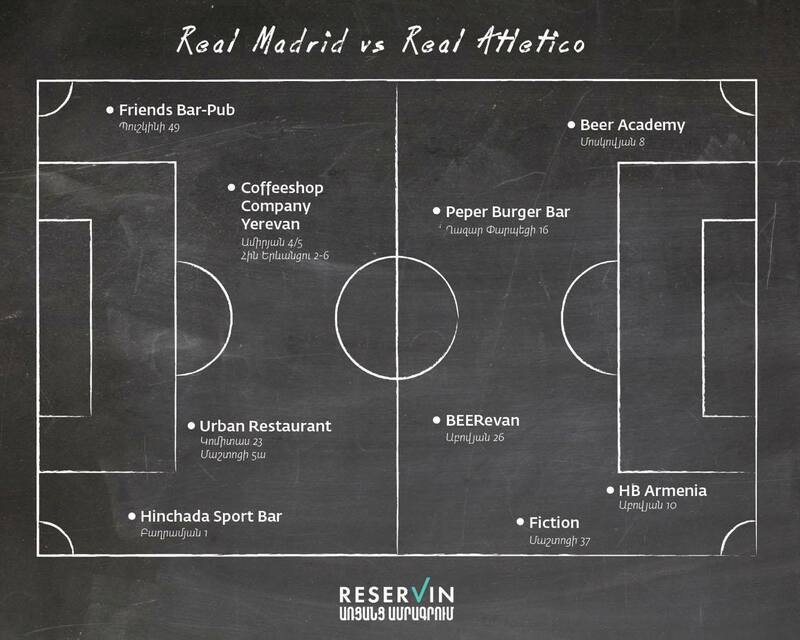 "Real Madrid" vs "Atletico Madrid" match will be shown in the HB Armenia. Enjoy the pleasant atmosphere, delicious refreshing cocktails, beer, and watch the beloved game. HB Armenia is located at Abovyan 10. Champions League finale will be screened at the Urban Restaurant. You can also try the delicious food, beer and worship for your favorite team. Urban Restaurant can have to branches: at Komitas 23 and Mashtots 5a. The best place to watch the Champions League finale for active people is Fiction pub. So, watch out for a good time and you can visit the Spanish Football battle a Mashtots 37. Gather your fan club and go to the Friends Bar-pub, watch the "Real Madrid" vs "Atletico Madrid". Friends Bar-pub is located at Pushkin 49. For those who love to eat delicious dishes, and eating during an important football matches, Peper Burger Bar is the best place for it. Address Parpetzi 16. Best sporting atmosphere awaits for you at Hinchada Sport Bar. To watch one of the best football match of the year you can visit here. Baghramyan 1. We wish everyone a pleasant evening.